Why is competitive insulation important? Most products and services compete on a parity landscape. To be successful requires more than the sliver of difference that exists between you and your competition. You need something extra. You need an effective website. “Making loyalists out of 5% of customers would lead, on average, to an increased profit per customer of between 25% and 100%. Your best customers are likely driving most of your sales. And they are responsible for 80% or more of your profits. I’ve seen analysis that showed that best customers drove over 100% of profit. The business was losing money on the rest. Keeping this small subset of your customer base coming back is vital. Increasing their numbers is huge. If customers have a relationship with a brand, they are less likely to jump to the competition. The relationship your company has with its customers can be effective competitive insulation. There’s more on the nature of brand relationships below. Your website is an ideal place to create a relationship and thus competitive insulation. In the digital age, it’s the place where customers go to learn more about you and your products. If they are considering your product or service, they will use your website for confirmation. They use it to find the information they need. You can use this natural tendency to your advantage. It’s a mutual advantage. Your customers gain value beyond the functional benefits of your product or service. You earn competitive insulation. Your website is an excellent place to use Customer Relationship Marketing to insulate your best customers from competitive pressure. But first, let’s consider what Customer Relationship Marketing is, and what it is not. The goal isn’t to become friends with your customers. That’s not realistic. You want your customers to feel a degree of affinity toward your brand. When this exists, all things being equal, they are more likely to choose you over the competition. They do this because, over time, you have delivered more value. “Value” in this sense is not the transactional value delivered by your product or service. Your product or service needs to be competitive. This is table stakes. It’s what you have to have to be in the market. The value we’re talking about is the value that comes from the intangibles. It can be practical, it can be emotional, and it can be both. It’s the value that lifts you above the competition. It’s the value that creates relationship equity. And relationship equity is competitive insulation. It makes the difference between a company that performs with the market, and one that outperforms the market. How can relationship equity help my business outperform the market? You invest in marketing and gain five new customers. Meanwhile, three customers have not come back to you. You are at net two. You invest in marketing plus current customers and gain six new customers. Four came from the marketing and two came from customer referrals. Only two customers don’t return. You are at net four. You create relationship equity with an effective website; it’s an excellent place to deliver extra value, which is what creates relationship equity. They use your product or service; they experience your site. Use it to add value that goes beyond the functional benefits. This adds up over time. An effective website is at the center of your marketing activity. We discuss this in Hub and Spoke Marketing. Now, take it the next step, use it to create the value that builds relationship equity and competitive insulation. But what is this value? How do I create it? Use the Relationship Marketing Principles to guide you, as the foundation for how you create added value. You can trace ninety percent of loyalty problems to the sales process. Dr. Stephen Epley, the founder of Epley Market Research and Consulting. Design your strategy and tactics to attract the best customers for the right reasons. Sell your value. Don’t coerce with a bribe. Buying your product or service does not mean they have a relationship with you. Are they open to it? Perhaps. But you have to earn it. Their interest in your product is high. They are willing to listen. But don’t deceive yourself, their interest in the category is high. They are also looking at the competition. Their interest in you, at this point, is a by-product of their recent purchase. Acknowledge them. Set yourself apart. Let them know, through words and deeds, that you value their business. They are listening. Now is the time to surprise them with value beyond your product’s functional benefits. Once you have created a connection, don’t abandon your efforts. The most important sale isn’t the first one, it’s the second. Reinforce how smart they are for buying your product. Give them every reason to buy from you again. Keep the plaid jacket at home. Talk to them like you have a relationship, not like some sales guy trying to make his numbers. We’re not suggesting that every customer gets a prize. Your customers know their worth to you. This is especially true of your best customers. Treat them like you know it too. Understand who your best customers are. They are the 20% of your customers who generate 80% of your revenue. Reward them. Surprise them. Delight them. Make them customers for life. Make them so happy they tell friends and associates what a pleasure it is to do business with you. The ROI for this small investment is huge. Especially when compared to the cost of acquiring new customers. Again, this isn’t for every customer. It’s for your best customers. Take the time to understand what went wrong. Then do something tangible to address their concern. Don’t take the relationship for granted, and they won’t either. They will give you a chance to make it right. They will because of relationship equity. But recognize that whatever went wrong used up some relationship equity. You need to earn it back. Each business is different. Your best customers are not everyone’s. How you use the Relationship Marketing Principles and your website to create competitive insulation depends on your needs and what your customers value. The following are some things we’ve seen that work. Identify your best customers and look at how they are using your product or service. This won’t be the same as the majority of your customers. Heavy users, generally, have distinct needs. Use your understanding of their needs in your marketing to entice heavy category users, your future best customers. Don’t coerce with a bribe. Said another way, don’t offer the incentive early, sell your value. This pulls in the right kind of customer. Your numbers will be lower but the value will be much higher. 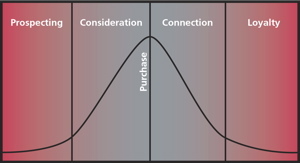 The time to offer an incentive is when they are deep into the sales funnel. At this point, they’ve given some sign of their worth. Now is the time to use an incentive to push them over the edge. As simple as this is, say thank you. Acknowledge them. Show them that you appreciate what they’ve done. Tell them that you understand that they have made a commitment to you. Use email marketing to check in with them sooner rather than later. Draw them back to the website. You want your customers to get used to the site being their source for more information. If you get to them early, they will come back. Their interest in your product and the category remain high after the sale. It’s a bell curve. The transaction is in the middle, not the end. But this doesn’t happen automagically. Invite them. Use your understanding of their unique interests to craft your messages and offers. What you say on your website is important. How you say it, is more important. Don’t be a shill. Leave the plaid jacket in the closet. Would you talk to your relationship now the way you did when you first met? It’s a commercial relationship. They expect you to sell them stuff. They want you to. Just don’t speak to them like you’ve never done business with them before. It’s not all about the warm and fuzzy. This is an excellent time for a cross-sell or upsell offer. Your emphasis once some time has past should be on value creation, not sales. If you do this well, the sales will come. Use email marketing to invite them back to your website. Use your blog to provide information and insights into their needs. But it’s about them not you. Your site should be a destination where they can learn the latest and greatest, where they can learn how to use your product in new ways, learn about what’s coming soon, etc.. Occasional sales-oriented messages are fine, just don’t drown them in onsite ads or bulk email. Make it easy to buy on the website. The website’s primary emphasis should be creating value and competitive insulation. Target your customers with sales messages that are relevant to their needs. If the targeting is tight, it blurs the line between what’s information and what’s sales, which also creates value. Good customers expect to be rewarded. But bribery is usually not the best approach. Of course, a monetary reward is appreciated. But it’s not the only way to reward. Provide your best customers with exclusive access. Give them early access to information. Give them their own contact/customer service channel. It tells them that they are special. A request for their opinion also sends a positive message. Make your website their special place. It’s the little things that matter here. When something goes wrong, and something will go wrong, take care of it. Don’t make best customers wait in a queue. They know they are good customers. Show them that you know it too. When you resolve the issue, kick your relationship marketing up a notch. Bring them back to the website. You used up some relationship equity. An effective website helps you earn it back. To be effective, websites need to be much more than a brochure. An effective website is a fulcrum that you use to build relationship equity among your best customers. This is your only true protection in any competitive marketplace. And it’s worth the effort. Loyal customers and especially your best customers are vital to your profitability. Use the five relationship marketing principles to guide your content strategy. Tells us in the comments about how you create competitive insulation.